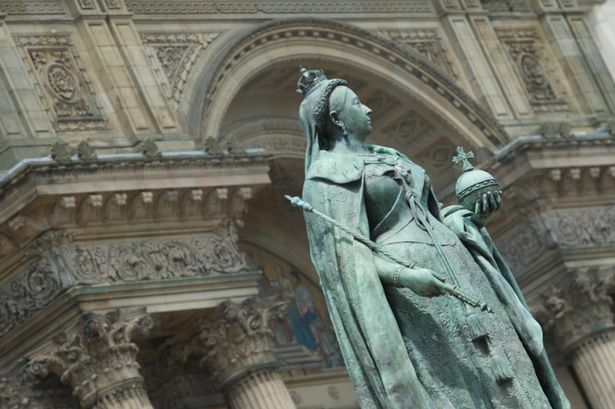 The Queen Victoria statue in Birmingham city centre is to undergo conservation cleaning as part of the civic society&apos;s 100th anniversary celebrations. The statue, in Victoria Square, is cared for by Birmingham Museums Trust on behalf of the city council and has stood in the city centre since 1901 when it was unveiled just 12 days before Queen Victoria&apos;s death. Originally created in marble by Thomas Brock, the statue was recast in bronze by William Bloye in 1951. The artwork now requires conservation work to clean and maintain the statue and its pedestal so it can continue to stand in one of Birmingham&apos;s most prominent locations for years to come. But the work will not remove green patina which has formed on the statue over time. Conservation specialist Ian Clark Restoration has been appointed to undertake the work which is due to begin by the end of April and be finished during May. The conservation of the statue has been part-funded by Birmingham Civic Society after it was awarded £55,700 last year by the Heritage Lottery Fund towards its &apos;The City Beautiful&apos; initiative. The project will celebrate and commemorate the centenary of the society. Rob Lewis, collections care manager at Birmingham Museums Trust, said: "Public art links the city&apos;s past to its present and the Queen Victoria statue is an important Birmingham artwork that stands proudly in one of the busiest parts of the city. "We are pleased to oversee the conservation plans as part of the civic society&apos;s centenary celebrations so the statue can continue to play an important part in the city&apos;s history."